Recently I photographed little Georgia and yes she had an amazing hair and very content approach to whole photography posing side. Her sister Charlotte was a little girl who was very preemie baby and was born weighting only 665 grams. The story was very touching and I have followed family throughout last year. It was emotional year for family, but here they are. Brave and happy to have one more little lady Georgia. You can read about Charlotte’s beginnings story here. Georgia’s mum sharing her experience. ” Being a new mum of two I am still trying to find out what works for us as a family. I am overjoyed to be blessed with two beautiful girls but it can often be tough as the age gap between them is only 23 months. When my oldest daughter, Charlotte, met her new sister for the first time, it was then that I seen how grown up she had become. For almost two years she had been the baby of the family so at first she showed a little bit of jealousy and her behaviour changed slightly trying to adjust to this new little person. Watching her say hello to her new sister and show her protective side almost instantly was amazing. Suddenly baby Georgia had become “Charlotte’s baby”. Every sound that Georgia makes, Charlotte is so intrigued by it. She constantly sits and watches over her sister, sometimes she is a bit rough with her so we are in the process of teaching her how to be more gentle and that lying on top of her isn’t something she can do. The first couple weeks were very hard. My first daughter was born very prematurely so to have a full term baby the second time was a new experience for me. To have my daughter home within a day and to have my oldest at home with us was challenging to say the least, but I’ve found that keeping busy and to be out the house has helped us a lot. I take the girls to a toddler group once a week which lets my oldest burn off some energy and I can relax for a couple hours and have a coffee! Being a busy mum of two I often forget to take pictures and then when I do, I use my smartphone where the quality is not like any professional photo. I am no photographer so often they are blurry or dark. This is why it was important for us to visit professional photographer and get set of beautiful baby photos. To have memories of my baby being so brand new, capturing every detail of her right down to her eyelashes and fingernails. Babies grow so quickly within a matter of weeks so it’s easy to forget how tiny and new they were. Having photos done of both my girls is very important to me too. My oldest girl, Charlotte, is still getting to know her new baby sister, Georgia and this comes across in the photos where she is showing her more curious side. The day of the photo session I was apprehensive of how my oldest would behave. I wasn’t sure if Charlotte would be out of sorts with the attention on Georgia or would she be really interested in what’s going on. With a toddler and a newborn it can often be a handful, finding a happy medium can be few and far between! The atmosphere of the session was completely relaxed. As soon as we arrived, Mitra helped to settle Georgia and get her ready for the photos. It was nice for us as parents just to have a short break and watch from the couches in the studio. I am always very unsure of how I would like the photos to look, which poses and colours are best but Armands is very helpful with ideas and he knows what works. I often give a few ideas but I am more than happy to go with the flow of the session. I have made a nice slideshow too. Feel free to share this post with your families. Expecting a baby? 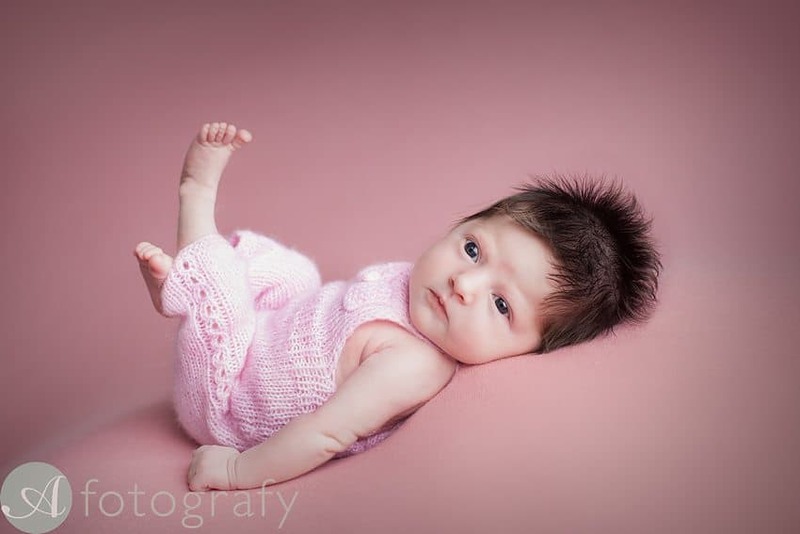 Would like to know more about newborn photography? Visit newborn education resource for parents here.